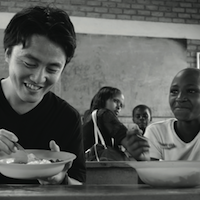 Former engineer, McKinsey consultant and author of ‘Connecting the World With 20 Yen’, Masa Kogure founded ‘Table For Two,’ an international group that aims to curb obesity in the rich world while ending hunger in Africa. Table for Two (TFT) is one of Japan’s fastest growing non-profit organisations and has distributed over 16 million meals to African children. In Japan the charity has over 520 participants including corporations, government offices, universities, hotels and restaurants. Kogure is now working on raising Table for Two’s international profile and has approximately 50 organisations outside of Japan signed up. The organisation gets corporate canteens and restaurants to serve Table For Two-branded healthy meals and donate 25 cents a meal toward free school lunches in African villages. Kogure has helped tackle the global problems of hunger and obesity via Table For Two. With their annual expansion program their reach will only get bigger, therefore supporting more people throughout the world. "In 2013 Kogure was awarded the Asian Social Entrepreneur of the Year 2013 by Schwab Foundation for his work with TFT. The Schwab Foundation has been identifying the world’s leading social entrepreneurs in over 50 countries around the globe since its inception in 2000. Kogure uses the power of social media to increase awareness of TFT’s message and as well as the usual Facebook, Twitter, YouTube and Blog channels, TFT also makes an effort to engage with bloggers around the world to spread the word. In 2012, Kageno recognised the support that they get from Masa Kogure and TFT. Kageno is a not for profit organisation that identifies communities in Africa who have limited access to healthcare, clean water and education. In 2012 the Executive Director and Co-Founder of Kageno confirmed that TFT was one of their most generous supporters and stated the following: “Masa KOGURE and their colleagues have, through vision, passion, and extraordinary hard work, built an innovative non-profit that contributes both to the world of the hungry and the world of the comfortably-fed. Table for Two provides an inspiring example of what can be done by people from any walk of life, who chose to be the change."